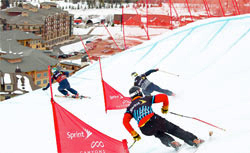 The final tour stop for the U.S. Snowboarding Grand Prix will be next week at the Canyons Resort in Park City, Utah. This event will feature the world’s best male and female Snowboardcross and Skicross riders. The course is on Doc’s Run, which is accessed off the Orange Bubble Express. The finish line is on the Ski Beach in the Resort Village. Spectators are free at the finish area, but a lift ticket is required for other viewing areas. On the last day of competition (Saturday) there will be a “Junior Jam” competition and a reggae concert by Patwa.